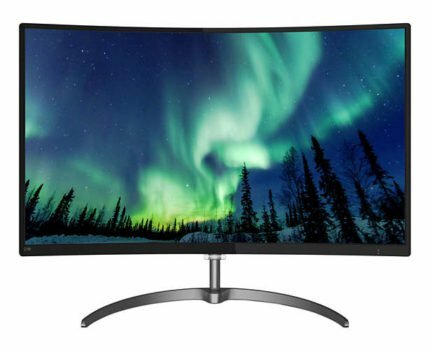 Philips has introduced a new curved monitor that will feature FreeSync, VA panel, and the Ultra Wide-Color technology for a precise color reproduction. The Philips 278E8QJAB may not have an appealing name, but the sleek design and the brilliant image quality which is a result of a high-contrast VA panel and the wide color gamut will certainly entice many viewers. Additionally, the slight 1800mm curvature and FreeSync make for an immersive and smooth gaming experience as well. All for a reasonable price of around $310, at the moment (April 2017). The monitor is already available in some countries including Germany and England. The Philips 278E8QJAB features a VA panel which provides a high contrast ratio for a superior relation between the darkest and the brightest colors while the black tones reach crystal-clear depth and clarity. Other assets of the VA panel include the impeccable 178-degree viewing angles, a quick 4ms response time for minimal motion blur in fast-paced video games, and a vibrant image quality. The Ultra Wide-Color technology surpasses the most common color gamut of 99% sRGB and goes on to cover up to 130% of the sRGB color space, which is 104% of the NTSC. While the color accuracy may allure some of the professional designers and video editors, the rather low 1080p resolution considering the monitor size will repulse the others. Due to the low pixel density, the image quality will lose on certain details and result in a somewhat slightly pixelated picture which is a critical concern for some designers. For casual gaming and other multimedia purposes, the Philips 278E8QJAB is a perfect monitor. Those with compatible AMD graphics card will be able to use the FreeSync feature which synchronizes monitor’s refresh rate with the graphics card’s frame rate and thus provides you with a more stable FPS rate and eliminates screen tearing, stuttering, and reduces input lag. However, the noted FreeSync range of 49-75Hz is quite low as once your frame rate drops below the dynamic range, it will stop functioning. 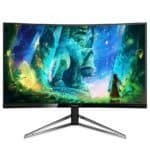 So, you will need a decent computer equipment for a smooth gameplay experience, which shouldn’t be a problem considering the Full HD resolution. In order to make full use of the high contrast ratio, the Philips 278E8QJAB incorporates the Philips SmartImage Lite. Once enabled, this features automatically adjusts the displayed content with optimal dynamic contrast, sharpness, and color saturation parameters in order to provide you with the best image quality possible. All you have to do is press the button. 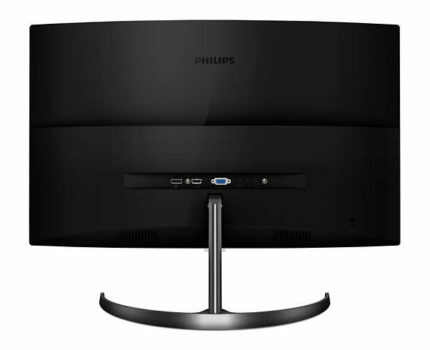 The design of the Philips 278E8QJAB includes a subtle 1800mm curvature which is sufficient for a mesmeric and immersive viewing experience. The ergonomic functionalities are somewhat deficient as there is no VESA mount compatibility and there’s only a tilting option by -5/20 degrees. The connector ports include a VGA, an HDMI, a DisplayPort, an audio line-out, and an audio line-in for the 2x3W built in speakers. 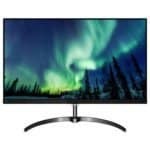 At the moment (April 2017), the Philips 278E8QJAB is available for $310 which is an appealing price considering the innovative color gamut technology for curved displays. In addition, the implementation of FreeSync makes it an excellent gaming monitor choice for the AMD users. When it comes to the image quality, there’s no doubt it will be brilliant due to the high contrast and wide color gamut. If only it had a higher resolution, preferably 1440p, it would be simply flawless. This way, many professionals will avoid it, making it a great monitor for casual high-quality multimedia use nonetheless. The Philips 278E8QJAB is an overall gorgeous monitor with many assets such as the superb contrast ratio, a subtle curvature for an immersive viewing experience, a wide color gamut, and FreeSync for smooth gameplay. The only drawback is the limited ergonomic support as there’s no VESA mount and height adjustment available. While the design imperfections may be neglected by some, the only 1080p resolution will certainly repulse many professional designers and editors due to the low pixel density image. 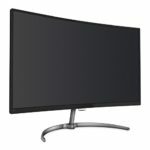 The 1440p resolution would make more sense for a 27-inch monitor with a wide color gamut, but then it would cost significantly more. This way, it’s an enticing monitor for everyday multimedia use and aspiring designers, available for a reasonable price. The Philips 278E8QJAB offers a VA panel with a superior contrast ratio and a wide color gamut that covers 130% of the sRGB color space. Additionally, FreeSync and a subtle 1800mm curvature make for a smooth and immersive gaming experience. The slim and modern design nicely complements the brilliant image quality and smooth performance which makes this monitor an excellent deal overall.